Thoughts of THAT Mom Thoughts of THAT Mom: Are YOU Guilty? I must confess. I am. It appears that I'm not alone. While I'm not the high...um...class (can you use that word here?) theft that CNN mentions in this article, I do regularly take "disposable" items when we stay at hotels. We don't even usually use the hotel's "stuff". We'll use our own soap, shampoo, & lotion which is already opened & pack the hotel's for later use. Yes. I'm THAT cheap! How do I justify my theivery? I figure these are items that they must replace after each guest anyway. If I wasn't taking it home to use later, I'd be opening it and using it while we were at the hotel which would mean they'd HAVE to throw it away. Does it really matter if I choose to wait and use the items at another time? I was surprised yet relieved to hear one hotel manager say that they assume anything with their logo would be taken. Why the relief? No. I've not stolen any towels. However, I had a favorite towel growing up. It had been taken my by dad (who shall remain nameless). 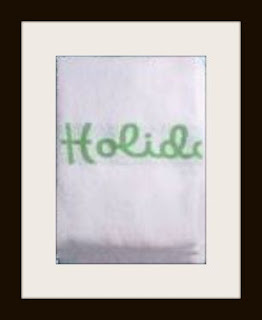 I could be wrong, but based on the logo, I'm fairy certain it came from a Holiday Inn. While it was my favorite towel, I always felt a pang of guilt each time I used it...even though I hadn't been the one to...um..."borrow" it. Nevertheless, we...dare I say it? We actually prized this towel. Probably a little too much for something that had been stolen. I see my dad has amnesty in more than one place. In August 2003, Virginia Bush, senior public relations manager for the chain said that Holiday Inn founder Kemmons Williams intended for people to steal his towels. He saw it as a huge marketing opportunity. According to this article, people "stole" them to the tune of 560,000 a year. I know where at least 3 of them can be found. 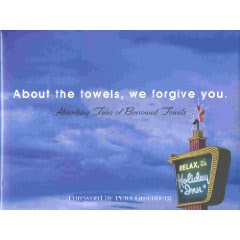 Not only that, but Holiday Inn actually wrote a book titled, "About the Towels, We Forgive You: Absorbing Tales of Borrowed Towels ". I feel a new sense of relief now. I can safely tell myself that Holiday Inn intended for my dad to "accidentally" stuff that towel (& the other 2) into his suitcase. I have to admit...I am JUST like you! No towels or robes or such...but I do confess to taking the soaps, shampoo/conditioner, lotions, shower caps, and mending kits for later use. They have to replace it anyway! Why not! Besides those mini lotions are great to throw in your purse! The mending kits are great for emergencies on the go! And who wants to spend money on a shower cap? LOL!